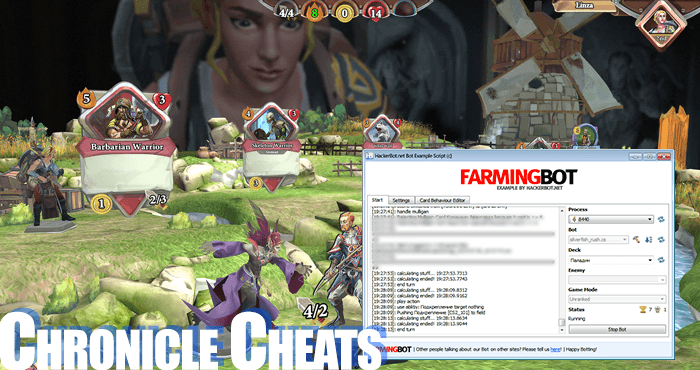 Is it possible to cheat in Chronicle: RuneScape Legends? As in any CCG, it is possible to cheat in Crhonicle as well. 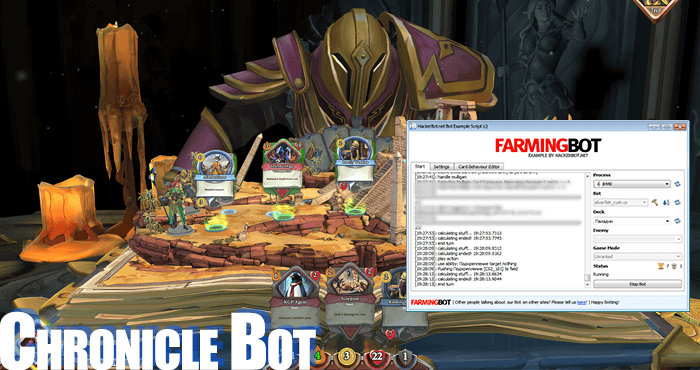 There are several methods, then most popular of which is to use a bot to automatically play simple decks and farm money (copper coins) automatically for you. Bots can be used to level up your legends and unlock all basic cards. Aside from the use of bots, there may be some game bugs that will come up from time to time that may allow you to farm money faster ect. However, there are no hacks or generators for unlimited copper coins, platinum ingots or card unlocking. Cheating in online games is completely legal everywhere in the world, but it is against the Terms of Service of the game, which basically means that your account can be banned by Jagex Games Studios, the developers of the game. So worst case scenario is that you lose your game account. To avoid that risk it is recommended that you use premium cheating software and bots for Chronicle RS Legends that is developed by professionals and undetectable. To find Cronicle RS Legends Bots and Cheats, click here. Bots are programs that are programmed to automatically play the game for you to farm some copper coins every day and allow you over time to get all the rare and very rare cards in the game without having to manually play the game for hundreds of hours. Bots do that by reading the game memory on your machine and then generating user input based on that information. Generally, a Cronicle Bot will be able to play simple decks more efficiently that more complicated ones. So what you generally want is a lot of minions, very few spells and weapons and a good cost curve. The best legend to run a bot with is The Raptor, since he has a lot of cards based around buffing up his armor and base attack, surviving to the 5th level and then dueling the opponent and beating them by simply doing more damage. However, if done correctly it is also easily possible to run a bot with all the other legends like Ariane, Linza, Ozan ect. However, you may need a little bit bigger of a cardpool to have them reach a decent winrate in casual and ranked. There may also be some bots for Dungeoneering mode in the future. Chronicle: Rune Scape Legends Unlimited Money, Platinum, Health… Is it possible? Chronicle is an online CCG game, which basically means that all the important data concerning your game account like your copper coins, your platinum ingots, unlocked cards, health during game, gold during game ect is stored on the game servers. In a single player game such values can be changed using hacks, since they are stored on your PC or console, but that is not the case for online games. It is entirely impossible to get such hacks working and anyone claiming otherwise is most certainly trying to screw you over. The most effective way to get platinum, gem shards and money is to actually play the game and farm it. If you don’t want to spend the time required, then you can have a Cronicle RS Legends Bot do it for you automatically. Other than that there is no other way than spending money, which supports the game and is highly recommended as well.